Beware of the owl! One is on the attack in Oregon. And a TV host has helped do something about it. 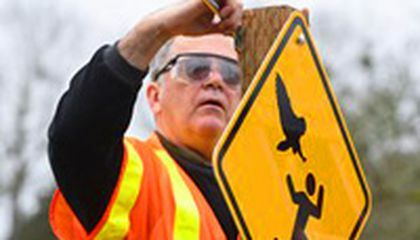 Rachel Maddow's comments on MSNBC inspired Oregon's capital city to post new warning signs in a park. That's where four runners reported attacks. The attacker was an angry owl. The bird was likely defending its nest against perceived threats. One jogger, a surgeon, said the owl hit him twice. The incident happened in Bush's Pasture Park in Salem. The bird struck so hard he thought he was having a stroke or an aneurysm. Another said the bird took his running cap. It also nicked his scalp. During her program, Maddow said the city should post a vivid yellow warning sign. She said the sign should use the iconic pedestrian stick figure bent forward at a run. Above, claws extended, is a raptor. Mark Becktel is the city's parks and transportation services manager. He said the city secured rights to reproduce the sign. Twenty will be posted. "It's just making people aware that there's an owl there. For whatever reason, (it) swoops down and goes after people's hats," he said. Birders say the assailant is a barred owl. It's an aggressive bird. That's especially true during the current mating season. They say it may calm down soon. That was a really aggressive owl. It was probably tiring to protect its baby. It probably thought it was trying to get its baby. The owl would of never have done that if it didn't look like it. That is so scary to be by a street that has a sign like that hopefully the people how got hurt are okay. 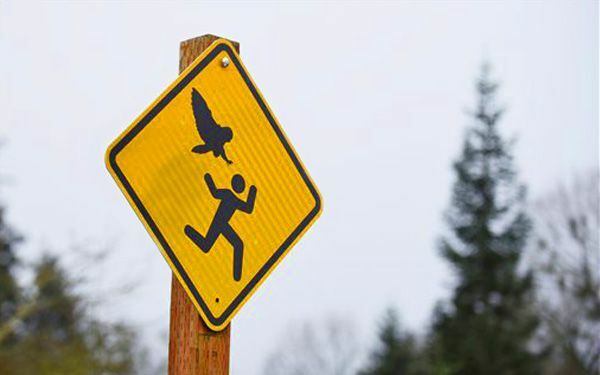 I think that it is horrible that owls would attack a person .It was a good idea to the sign up in the park. People should be more careful at times. I have never seen an owl in live person. I can't imagine being ATTACKED by that creature! How scary!!!!! I did not know that owls played!!! i love owls so much! when did the attack happen? owls are so cool!!! are owls birds or somthing else? just try not to go even more crazier things because that could kill people! The story that I just read was very interesting and I think that the owl is mad because some one is disturbing her nest or she thinks that some ones going to hurt her babies. Rachel Maddow had so much infuence because she lives in the country so she must be close to where there are less houses and more space where animals can live.